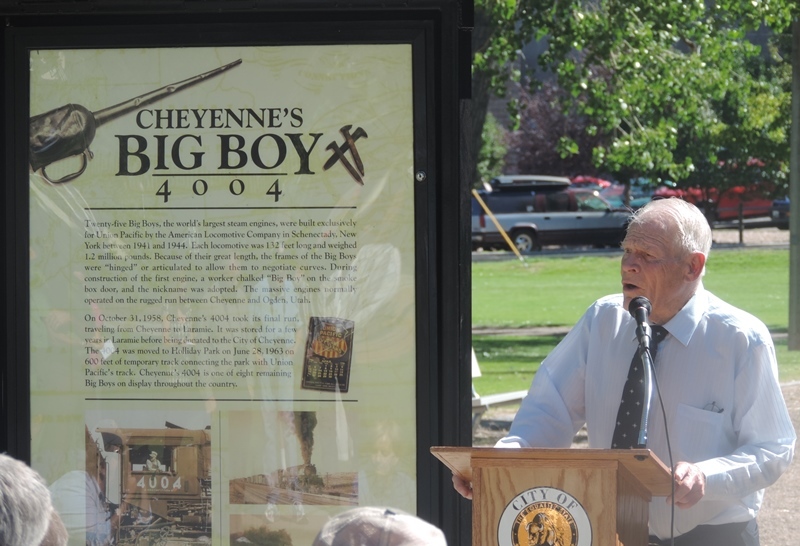 Cheyenne is home to TWO of the Big Boy Locomotives. No. 4014 will go on tour around the United States once it is restored within three to five years. Part of the restoration includes converting the engine from coal to oil as the source of heat to make steam. The engine is not on display during this time. However, visitors can tour the Heritage Fleet buildings and railyards behind the Historic Cheyenne Depot during Depot Days, which is always the third weekend of May. The Big Boy No. 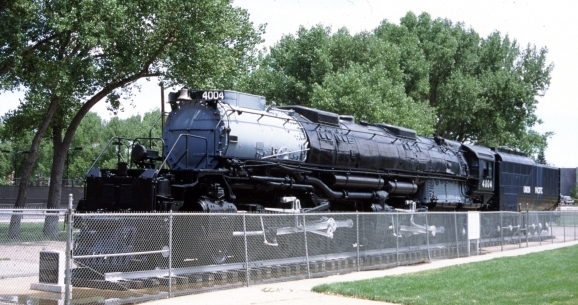 4004 (pictured left) has been on display in Cheyenne&apos;s Holliday Park for 50 years and has been a favorite attraction for visitors since then. One of his brothers is now housed at the UP Heritage Fleet&apos;s Steam Shop in Cheyenne. The Big Boy No. 4014 will be restored to full working order by 2019. 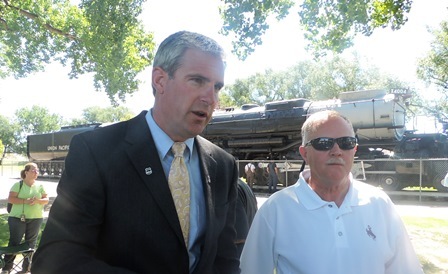 The Union Pacific Railroad worked with the Southern California Chapter - Railway & Locomotive Historical Society in Pomona, Calif., to transfer ownership of one of the world&apos;s largest steam locomotives, Big Boy No. 4014, back to UP (pictured right). No. 4014&apos;s last routine repairs took place in 1956, after it was in service for 41,000 miles. Despite the 50 years of standing unmaintained in the weather, the engine is actually in fine shape, said Ed Dickens, senior manager of UP Heritage Operations. Dickens (shown left wearing the suit alongside one of his team members) said that when he and his team went on a fact-finding mission in August to No. 4014&apos;s display in Pomona, his imagination went wild with all the potential problems that might occur after the engine sat out in the weather for five decades. "I crawled up in the boiler and touched the valve oil," he said. "It was like the oil was put in there just yesterday. It&apos;s just a beautiful boiler barrel." The home of the UP Heritage Fleet is in Cheyenne, where UP runs No. 844 around the nation during the warmer months. The Heritage Fleet is also currently repairing No. 3985 in the Steam Shop behind the Cheyenne Depot and the team is restoring No. 4014. 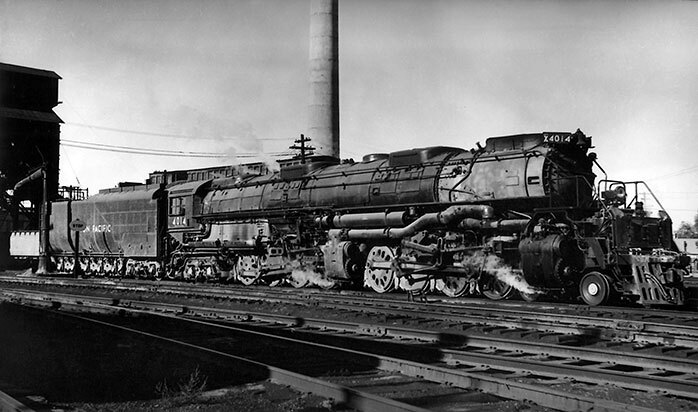 In 1941, the Union Pacific put 25 Big Boys into service. They were 132 feet long and weighed 1.2 million pounds. The frames were incredibly long and so they were "hinged," or articulated, to allow them to negotiate curves. They had a 4-8-8-4 wheel arrangement, which meant they had four wheels which guided the engine, eight drivers, another set of eight drivers, and four wheels following to support the rear of the locomotive. The massive engines normally operated between Ogden, Utah, and Cheyenne, Wyo. Eight of the Big Boys were put on display, including No 4004 in Cheyenne and No 4014 in Pomona. 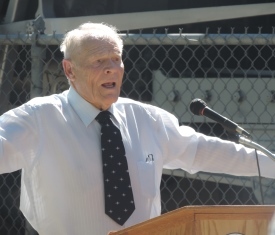 "When we got ready to move Big Boy in position in 1963, the railroad officials asked me to be the high baller," he said. "I was to stand in front of the engine and extend my arms straight out and wave them in a circular motion ... With that the engineer understood to move ahead. "When I started, I moved my arms as fast as I could," Nation said. "But they stopped me because that was a mistake: It meant for the engineer to go as fast as HE could. Good thing there wasn&apos;t a lot of track, or I would have waved him right downtown instead of right here by the trees." While the rails of the past could not bear the weight of the Big Boys beyond their normal operating route of Ogden, Utah, to Cheyenne, the rails today are able to handle the Big Boys.